Clinical documentation does much more than determine coding and compensation. It is the information needed to manage chronically ill patients, compare health statistics, and report quality data. It also drives malpractice defense, proves regulatory compliance, and justifies medical necessity. As providers move toward population health management, accurate clinical documentation will be mandatory for maintaining healthy populations and, with the rollout of ICD-10, it will be essential in establishing the severity of illness, risk of mortality, and level of specificity required for assigning the most precise diagnosis-related group (DRG) the one code deemed impervious to an auditor's review. Documentation tools must allow providers to paint an accurate picture of their patients using structured, discrete data. The way data are documented also must be standardized; moreover, without consistency an organization will not achieve true quality as constant variation will never give a true, relevant picture about what really works. This standardized vocabulary must be a balance between predetermined choices and the flexibility to capture the gravity of a patient's condition. Using these data to record diagnoses, symptoms, surgical procedures, treatments, and drugs allows users to measure the effectiveness of the care provided. Also, standardized data increase the benefits of an EHR system by capturing accurate clinical data that can be analyzed and reported. 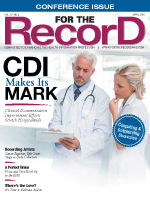 With the advent of the severity-based Medicare severity DRGs (MS-DRGs), hospital administrators have realized that if the medical record does not adequately depict a patient's condition, they are unable to justify higher than average length of stay, utilization patterns, or associated costs. Capable providers may appear to have poor performance in these areas because documentation does not accurately reflect the criticality of the condition. As a result, these organizations will rank poorly on a range of measures that grow every year as value-based purchasing and pay-for-performance programs mature. For this reason, clinical documentation improvement efforts must be quality initiatives led by providers as a way to advance patient care. The message to physicians should be simple: Accurate clinical documentation is a requirement for good communication. It is how comorbidities will be captured and evidence-based logic explained. To prevent duplication or omission of services, documentation must be proactive in monitoring services rendered. In addition, hospitals that coordinate clinical documentation requirements, quality initiatives, and collaborative training will be better positioned for the transition to ICD-10. Documentation of all clinical findings on admission is crucial. To ensure continuity of care and consistency, the record must be a thorough and accurate communication tool. To capture the resources that a hospital consumes working up a patient, the physician needs to document all possible, probable, or suspected diagnoses that may be causing the patient's symptoms. This justifies the diagnostics being done, as well as clarifies the evidence-based logic behind the established treatment plan. Any clinical finding that is present on admission should be documented as such. This will not only aid in capturing diagnosis-specific complications but also prevent them from later being misinterpreted as hospital-acquired conditions. Providers also must be watchful for findings identified in ancillary assessments such as nursing or dietary. Skin breakdown or malnutrition may be a complication or comorbidity; not linking either to one of a patient's multiple diagnoses will result in a lower MS-DRG as well as impact ICD-10 implementation. Likewise, providers must remember that coders cannot assume and nothing can be implied. A coder or case manager may see that the patient has a potassium, or K+, level of 6.8 and believe this is a complication resulting from one of the patient's diagnosis. Unless the provider specifically documents the patient has hyperkalemia, that abnormal lab value cannot affect the code assignment. It is important to identify the precise principal diagnosis at time of discharge as well as clearly detail the clinical decision making behind this conclusion. Providers should be encouraged to document every probable diagnosis at the time of admission as this will justify the diagnostic testing being done as conditions are ruled out. The medical record also must establish the medical necessity of each inpatient day and every treatment provided. Statistics from The Clinical Documentation Improvement Specialist's Handbook, Second Edition, reveal that insufficient documentation resulted in most Medicare repayments to hospitals being tied to incorrect coding (42%) or an inability to confirm medical necessity (41%). The Uniform Hospital Discharge Data Set (UHDDS) guidelines define the principal diagnosis as "the condition established after study to be chiefly responsible for occasioning the admission of the patient to the hospital for care." The principal diagnosis largely determines the MS-DRG; therefore, it is imperative that the clinical findings warrant the final code. With the belief that sicker patients should be compensated at a higher rate, the Centers for Medicare & Medicaid Services (CMS) encourages accurate capture of criticality; this is not upcoding. To quote CMS: "We highly encourage physicians and hospitals to work together to use the most specific codes that describe their patient's conditions. Such an effort will not only result in more accurate payment by Medicare but will also provide better information on the incidence of this disease in the Medicare patient population." In addition, secondary diagnoses—those that impact staffing patterns and hospital costs—ought to be documented. UHDDS defines these diagnoses as "all conditions that coexist at the time of admission, that develop subsequently, or that affect the treatment received and/or the length of stay." These are considered additional diagnoses requiring clinical evaluation, therapeutic treatment, diagnostic procedures, extended length of stay, or increased nursing care and monitoring. Thus, hospital leaders are realizing financing a formal clinical documentation improvement effort is money well spent. Effective clinical documentation promotes both the patient's well-being and the stability of the organization. — Susan Holst, RN, is a principal consultant at CTG Health Solutions. She has more than 40 years of health care experience that includes 16 years specializing in clinical information technology working with large teaching hospitals, provider networks, and payer groups.